Bulletin: a lightly used, custom-built Caravelle Rowing Skiff is available now in our brokerage. See our boats for sale page here. The Caravelle sailing version takes a 60 SF lugsail. The Caravelle sailing version includes enclosed plywood tanks for safety. The Caravelle has a slightly wider bottom than the Echo Bay making for a more stable boat. The Caravelle Skiff shares many features with her smaller sibling, the Echo Bay Dory Skiff. The design brief for the Caravelle was to preserve the lightness and convenience of the Echo Bay in a boat suitable for tandem rowing. Weighing only 115lbs, the Caravelle can be transported on top of a car, greatly increasing the territory to be explored. Intended primarily as a fast rowing skiff, a number of Caravelles have been built with just rowing in mind. Her profile has been carefully drawn with a partially submerged stem to prevent pounding and maximize waterline length, and a transom just clear of the water, allowing for high efficiency under oars. As with the Echo Bay, the Caravelle is a sprightly sailor. Initially more stable than a dory, her flared sides generate tremendous stability under a press of sail, and the profile of the bow ensures that she cuts through the water without pounding. When off the wind, the Caravelle’s longer waterline and flat bottom allow for a surprising turn of speed. As with the Echo Bay, flotation tanks fore and aft ensure peace of mind in rough weather. Construction of the Caravelle Skiff closely resembles the Echo Bay: 6 mm Okoume plywood bent over stem, frames, and transom. No strongback is needed, simplifying the building process and saving time. Where the sides meet the bottom, a wood chine runs the length of the boat, eliminating the often messy and tedious task of filleting and fiberglassing in this area. The frames in the kit version of the Caravelle come with tabs that fit into slots in the side panels, ensuring perfect alignment with the bottom – a welcomed convenience when building without a strongback. The only fiberglass necessary is 2 inch glass tape on the exterior of the chines, to seal and protect the joint. Construction time takes about 150 hrs. My first sail in the Caravelle Skiff was on a late fall day, with a fresh wind out of the west. I was concerned that the boat might feel tippy under sail, but when the first gust pushed the rail down she began shouldering through the water with very little fuss. With her excellent rowing performance, natural sailing ability, and ease of transport, the Caravelle Skiff represents the perfect combination of performance and practicality. The Caravelle story is very similar to the Echo Bay Dory Skiff. How can one get the capacity, seaworthiness and versatility of a dory into the body of a dinghy that can row and sail with the rest of them? The Caravelle can be seen as a stretched version of the Echo Bay but it is not that simple: it was very much drawn as a distinct and independent skiff from the Echo Bay with distinct purposes in mind. One purpose was to achieve a lightweight, cartoppable dinghy design that can be rowed by two adults. She was intended to primarily be a fast rowing skiff and a number of Caravelle plans and kits have been built for just rowing in mind. But the overall stability of the hull meant that a sail rig could very effectively be added. When these skiffs are pressed down, tremendous stability results as the flared hull settles in the water. Under a press of sail, the skiff is as fun as it is under oars. She cuts through the water with hardly any sound from the bow except for the bow wave. So many flat-bottom skiffs slap the water as the row or sail, but not this one. The profile of the skiff has been carefully drawn to be submersed in the bow and out of the water at the transom, eliminating the slapping and worst pounding in choppy water and ensuring that the transom clears when under oars. Yet, when under sail the flat bottom allows a surprising turn of speed when off the wind. My first sail in the Caravelle was a late Fall day with a fresh wind out of the west. I was concerned that the boat would feel tippy under sail. She is sensitive, for sure, but really absorbed the gust of wind, heeled some more, and begin charging through the water. The CVS builds just like the Echo Bay Dory Skiff: no strongback, over frames and bulkheads, with wood-chine construction. Wood chines do not require hours of filleting and fiberglassing. Fillets are certainly used in places to reinforce a joint, but the only required fiberglass is 2" glass tape along the exterior chines to seal and protect the bottom hull joint. The CVS has one extra frame than the EBDS. 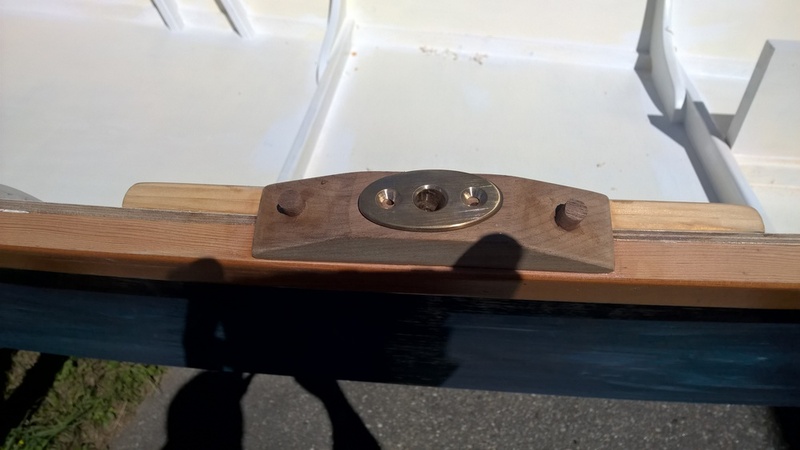 As in the EBDS, the kit's frames come with a tab that fits into the side panels, making the bending of the planks easy and guaranteed to result in the proper alignment of the boat, something very important in a boat without a strongback.